Our on-site musical instument repair department is very important to us. It's the backbone of our business and is what makes us more than just another music shop. 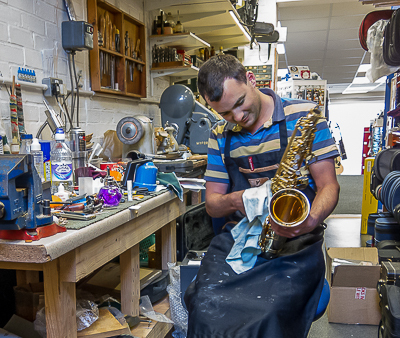 Our repairers handle repairs for woodwind, brass, orchestral stringed instruments and guitars. So if your flute, clarinet, saxophone, trumpet, violin, cello, much loved guitar or any other instrument needs a little work, bring it in and we'll take a look. We undertake hundreds of repairs every year, from a replacement pad to a complete overhaul, from a broken string to a complete restoration. We also offer free advice and estimates to everyone. Please contact one of our shops to find out more or just pop in with your instrument. All instruments that we sell through the shops or online are thoroughly checked and regulated before being sold. We like to ensure that an instrument will fit together and play just right so you can enjoy it at it's best. Instruments often come to us from the manufacturer in a condition that is best for long distance bulk shipping, such as the bridge not being fitted on a violin or cork blocks on a clarinet to support the keywork. We ensure all these things are set up for you and the instrument will play perfectly when you receive it from us. All new instruments are guaranteed for one year. If anything goes wrong we can usually put it right promptly while you wait. We offer continued backup for our customers, with a prompt and efficient repair facility. Woodwind repairs by Jim Prior & Brian Ackerman - Brian used to teach instrument repair at Merton College in London before starting up his own music shop and repair business. He is also vice-president of NAMIR (National Association of Musical Instrument Repairers). Brass repairs by Jim Prior - Trained at Merton College. Worked previously for John Myatt and Normans.